Last Thursday, Apple CEO Tim Cook publicly revealed he was gay. The next day, a memorial to Steve Jobs in Russia, which was erected outside a college in St. Petersburg, appeared to be dismantled by the firm that originally set up the memorial. At first, it looked like a case of homophobia, which is rife in Russia thanks to the so-called “gay propaganda law,” introduced in June of last year, which prohibits the promotion of “non-traditional sexual relationships” among young people under 18. But the firm that took the statue down, and the local university, insist that’s not the case. According to Russia Today, ZEFS, the holding of companies that erected and then dismantled the giant iPhone memorial, explained why they took down the monument. The firm says it reached out to remove the monument before Tim Cook’s public essay on Thursday because the sensor screen on the giant iPhone had been malfunctioning. 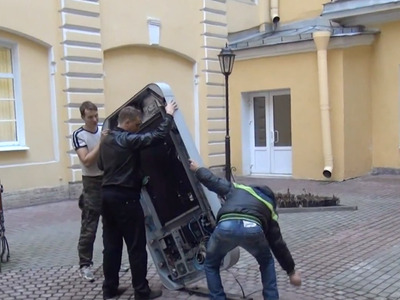 The St. Petersburg State University of Information Technologies, Mechanics and Optics (ITMO) concurred with the statement from ZEFS, stating that the university had been asked to take down the memorial to fix its sensor screen prior to last Thursday. Students at the university also told a local Russian news outlet that the monument was indeed malfunctioning. The head of ZEFS told Russia Today that he would reinstall the memorial, but only if it can “send a message to the US rejecting the use of Apple devices.” So while a faulty screen may have been the reason the monument was taken down, it doesn’t sound like the firm is a big fan of Apple right now, for one reason or another.